Dilemma: You’re a project manager, and you’re in dire need of resources to complete the project. You’ve told your boss several times that you need more resources, but she hasn’t acted on it. You want to go over her head, but you don’t want to seem to be doing so. Who hasn’t experienced mysterious foot-dragging by a boss? It’s the type of scenario that can leave any good manager scratching his head and wondering why his pet project – which was once hailed as mission-critical – has now ground to a halt. How do you remind your busy and distracted boss of your pressing need, without pestering her or alienating her? Is there a clever way to send a subtle message so that your boss will wake up and take action – without you ‘ordering’ her to? Well, perhaps. But it’s tricky, and not without risk. If your boss has a brain, chances are she will put ‘two and two’ together, and see the subtle message for what it is: A flashing neon reminder that you want her to do something! Will that be welcomed? Or resented? Assuming that none of the above reminder methods worked, or were rejected out of hand, what are your options? Marching into the CEO’s office – even if you had tons of chutzpah and no fear of being unceremoniously booted out, might not be the best route. Even if the CEO miraculously agreed with you, and immediately ordered your boss to commit the resources, it would be a very heavy-handed and expensive pressure tactic. You would now have a boss who is quite likely furious that she was forced into doing your bidding by the CEO. Yes, you would have the resources for your pet Project X, but you would also have made an arch enemy. Not a smart office politics move. So how can we go over the boss’ head without seeming to? How can we influence her to commit the resources? What tools do we have to influence her behavior? 1. The boss is withholding the resources and you don’t know why. 2. You are holding the ball for this project, and for whatever reason, your boss does not feel responsibility for it. 3. The project is important to you, and its failure would reflect badly on you. To motivate the boss to free up the resources for our project we need to recognize one of the basic principles of human nature: It is easier for us to do something if it is in our self-interest. Our objective should be to move the boss from being an uninvolved bystander who feels she has nothing to gain, to an interested party who can see that for very little effort and reasonable cost expended, she will benefit nicely – or conversely, suffer if it flames out. That sounds wonderful in theory, but how can we make it happen if she won’t even give the project the resources to get off the ground? We need to get other people to tell her – without us coercing them – why this project is a winner/important, and how she could benefit from its success (or be tripped up by its failure). However, if we go around the company actively lobbying key executives for our project (as in example c), would that succeed? In all likelihood, the boss would get wind of it, and could feel unduly pressured and uncomfortable. How can we generate positive buzz without going behind the boss’ back? Our objective should be to create ‘positive buzz’. We want our project to move from ‘unknown and overlooked’, to ‘being talked about’ by others. But we need that to happen in an open and fully transparent way (skulking behind the boss’ back could come back to haunt us). We want to get people openly buzzing about our project, so that our immediate boss will realize that it is in her best interests to help it succeed. So, how do we create that magic buzz? Let’s borrow some concepts from 360 degree interviews and mash them together with brainstorming sessions (à la Lateral Thinking guru Dr. Edward de Bono). The universal truth underlying this tactic is that almost everyone loves to share their opinions, and will gleefully tell us all the things we’re doing wrong (especially if they don’t feel they will be stuck with the task of fixing the problem). We’re going to exploit this to move Project X into the limelight. Your first step should be to tell your boss what your plans are – highlighting for her the importance of innovation and feedback in the success of leading-edge corporations today. To warm her up, you could cite the fascinating statistic* that Toyota staff generate over 1 million new ideas annually… Or dig around for a relevant statistic in your industry. Innovation is hot – and it’s a motherhood issue. Nobody but Neanderthals and Luddites can seriously be against innovation in the 21st century. Whether you have ‘Brown Bag Lunch Presentations’, a company Wiki, or a Creative Brainstorming Session, the basic idea here is to use a relaxed venue to inform others in the company about your project and invite their input on how to make Project X a winner, and deliver bottom-line value to the company (thus justifying the resources). A brainstorming structure we use in our creative projects with clients, is threefold. This process – which draws on input from across the company, and from many levels, can actually identify roles and responsibilities that go far beyond your department. It may open your eyes to something your boss already knows, but has been reluctant to tell you: That Project X will not succeed unless you have the support of marketing, or customer service for example. But it’s better to know that in advance, so you can take appropriate action – and try to build that support structure in now. Opening up your pet project to criticisms and suggestions across the company is not without risk. Just like those pesky 360 interviews, you actually have to be prepared to listen. Certainly telling others about Project X may expose flaws – and divisions. But, if Project X really is a winner, delivering bottom-line value to the company, then it could be just the tactic to get your project ‘green-lighted’. If your project is any good, this process should attract attention to it – and quite possibly some terrific cross-departmental suggestions on making it a success. And it will have another benefit: Identifying you as a forward-thinking, innovative manager who is smart enough to gather different opinions in order to make his project a winner. By using this method you should have moved Project X from ‘unknown and overlooked’, to ‘being talked about’ by others, all in a transparent above-board way. Of course its ultimate success rests on your brainstorming session. Did it provide the evidence that Project X is truly worthy of the company resources? If so, the good word should get back to your boss from many sources, and help her to see that it is in her best interests to ride this winner. So, let’s revisit the dilemma and the concept of the subtle message again. Since you are a very bright manager, you will want to also consider every eventuality. Such as… perhaps your boss has known all along that you were trying to send subtle messages to her to move forward? But she, in return, has stubbornly been sending you subtle messages too. Frankly, she thinks Project X is a certified loser and she is purposely dragging her feet in the hopes that it will die. Straightforward communication with your boss is obviously the fastest and best way to ferret out why your boss is not supporting the project. However when you are faced with a boss who refuses repeated requests for an explanation – then the brainstorming sessions may prove very useful to building buzz, identifying strengths and weaknesses, designing a bullet-proof initiative, and ultimately getting what you want: The green light. Please take our Polls (see sidebar at right) and join the conversation by leaving a comment below. 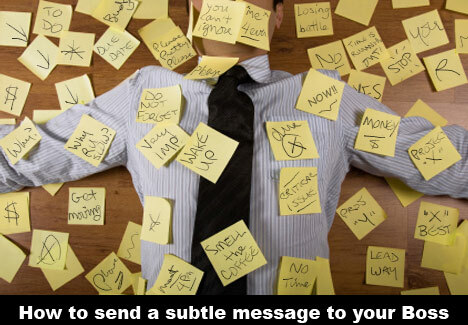 “How to Send a Subtle Message to your Boss” article published simultaneously in the American Management Association e-newsletter Performance & Profits. Franke James, MFA is the Editor & Founder of Office-Politics.com (est. 2002). Franke’s Office-Politics advice and articles have drawn media attention in print, on radio and television. As an adviser, Franke draws on more than 18 years of business experience as an entrepreneur and creative communications professional. Her answers to Office-Politics dilemmas have received consistently positive feedback, e.g. “Thanks so much for your advice. I value it and will print it out and carry it with me as a reminder.” She is also the Inventor of The Office-Politics® Game a dilemma-based social game that teaches you how to play, and laugh, at office politics. It’s used by HR departments, and corporate trainers worldwide. Delivering difficult messages to your boss can indeed be a hard task, and I read this article with great interest. Franke James offers up an excellent way of dealing with this particular dilemma. The crux of the solution is to get people talking face to face about the difficult stuff. If your team can be open and honest, problems like the one in this particular scenario would virtually cease to exist. That is why we are working so hard to try to bring about a change in corporate cultures by getting people to say things straight and to each other, rather than storing up difficult messages or even worse conveying them in a destructive and anonymous way. Brainstorming sessions are a great way to get opinions out into the open and bounce ideas around. However, I can’t help but feel this cures the symptom rather than dealing with the problem at large, as brainstorming sessions are not frequent occurrences. If the issues were dealt with in conversation (something that happens quite frequently! ), there would be no need to hold a brainstorming session. Obviously this brings us back to the problem of delivering tough messages to your boss. That is why we have developed a feedback system, which through its structure enables people to sit down with each other and say the difficult things face-to-face. Maybe his/her boss is telling him/her that the resources just aren’t available, and your boss doesn’t know how to tell you. As project manager, it is your job to evaluate the consequences and provide the alternatives to your boss so s/he has the basis for deciding what to do. If you spell out the trade-offs, s/he can take them to his/her boss. If this is the situation, just “selling” a project by creating buzz can be counter productive. Great Info, need some translation thought, but good enough to translate ! Thanks a lot !